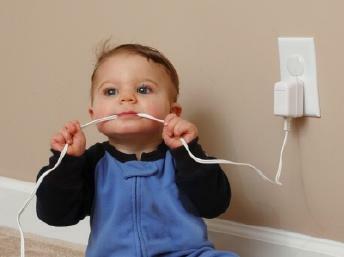 Children are naturally curious and do not know the dangers of electricity. Teaching them the basics about the power of electricity and electrical shock helps to keep them safe from harm. The following basics of electricity are important for children to understand. Electricity has the power to cause burns, shocks and even death. Appliances and power cords can be just as dangerous as electrical power lines if you do not take proper safety precautions. Electricity flows easily through water, and it will travel through your body since your body is made of 70 percent water. All children, regardless of their age, need to be aware of the dangers of electricity. While the following safety tips are for all children, there are some tips that are more applicable for older children. Never stick your fingers or any object into an electrical outlet or light bulb socket. Keep fingers and other objects out of small appliances, such as toasters, even if the appliance is off. Keep electrical wires and appliance cords away from sources of heat. Never touch any electrical appliance or device, such as a light switch, hair dryer or toaster, if you are touching water. Never pull an electric plug out of the wall outlet by yanking on the electric cord. Never use any electrical appliance if you are wet. Do not climb trees that are near power lines or have power lines running through them. If you are flying a kite, or have Mylar or helium-filled balloons on strings, make sure to keep away from power lines. If the kite line or balloon strings are tangled in power lines, the electricity can travel down the line and cause a shock or start a fire. Never go swimming during an electrical storm. If you see something stuck or tangled in a power line, have an adult call the power company. Never try to remove the item from the power lines yourself. Do not climb utility poles. Keep away from electric substations. Do not climb on fences around electric substations. If you see a fallen electrical wire, stay away from it. Have an adult call the power company to report the downed wire or call 911. Never touch anything or anyone touching a wire that is down. Call 911 or have an adult call 911 immediately. Be careful to avoid touching overhead electrical wires if you are carrying a long object such as a pool skimmer or ladder. Never throw objects, such as sneakers, at or onto electric power lines. Never fly model airplanes or remote controlled airplanes or helicopters near overhead power lines. Play with them in open areas such as parks or fields. Never go into an electric substation for any reason. If a pet has gone into the area, do not try to get it yourself. Have an adult call the power company. Do not hang signs or banners on electric utility poles. If a friend, family member or pet is in contact with a downed electrical line or any type of electrical equipment, call 911 or have an adult call 911 immediately. If you are operating an electrical tool, using an electrical appliance or playing with an electrical toy outside, stay at least 10 feet away from any wet surface or swimming pool. Do not touch any electrical tools, appliances or toys if you are wet, standing in a puddle or are in a pool. Com Ed provides free lessons plans for teachers on electrical safety lessons. Richmond Power and Light provides games and puzzles about electricity and an electrical safety quiz.